Many years ago when I first heard about Sharpener Pro I thought "that's a lot of money just to sharpen an image when Photoshop does it for free." Since then of course, like many of you I've spent countless hours not just sharpening images but using and evaluating many different sharpening products. Until recently my favorite has been Photokit Sharpener from PixelGenius. In particular I really like the way it separates sharpening into three components--Raw "input"-sharpening, "creative" sharpening and "output" sharpening. That dovetails nicely with my workflow where I can apply the input sharpening to the image when I first open it (and even flatten the sharpened layer onto the Background to save space) then use Creative sharpening to accentuate key elements of the image--I always use it with a mask so that I only selectively sharpen portions of the image, and then finally the appropriate output sharpening for the printer and paper I'm using at the time. But Photokit has two drawbacks for me. First it does not work with Photoshop Elements. As Elements improves its capabilities an increasing number of my safari participants rely on it to edit their images, and many of the articles I write require that examples be doable in Elements, so I needed a solution that would work with both products. And Photokit sharpener, like all the other products I had evaluated, required that I manually create a mask for each image. Frankly with Quick Mask that only takes a few seconds but it does mean that each image has to be opened and edited before I save, post or print it. nik Sharpener Pro 2.0 worked with both Elements and Photoshop, which was a great plus, but I found I still had to create masks to get the effects I wanted. It also didn't differentiate between the various steps of sharpening. Then this week I heard about nik Sharpener Pro 3.0 which promised solutions to both of these issues. Josh Haftel and the team at nik were kind enough to send me a copy of Sharpener 3.0 to evaluate. I was a little reluctant to take the time to experiment with yet another sharpening product, but it's an important enough step in making images look great that I went for it. To cut to the chase, I am very impressed. Not only does Sharpener Pro 3.0 resolve the short-comings of version 2, but the results really just plain look better. Color contrast in particular is improved. It's always taken a bit of a math background to sort out the effects of Radius and Threshhold, the traditional settings that can be tweaked for Unsharp Masks. nik has given us all a leg up by introducing a set of fairly logical settings we can use with Sharpener Pro 3.0.
image. Increasing this slider emphasizes fine details throughout the image while decreasing this slider reduces the appearance of fine details for smoother surfaces. Local Contrast — Controls local contrast throughout the entire image. Increasing this slider will increase the edges of small objects throughout the image while decreasing this slider will lower the contrast of edges, applying a diffusing effect. Focus — Controls the adaptive sharpening of fine image details and large areas of the image. Increasing this slider will increase the overall strength of the adaptive sharpening and decreasing this slider will decrease the adaptive sharpening, applying a slight blurring effect to the image. By tweaking these sliders you can control the effect of your sharpening in a relatively powerful but still easy to use way. 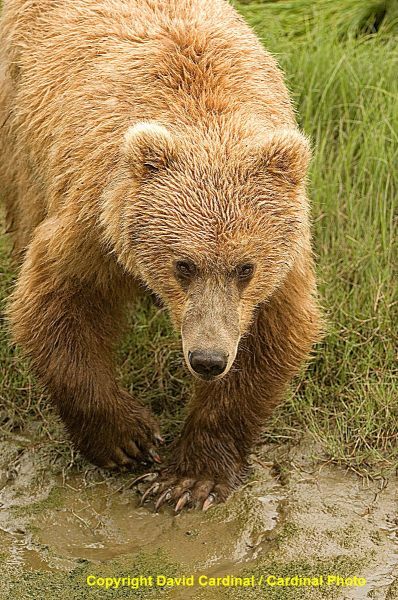 The Grizzly Bear image on the right is a great example of one which is sharpened more effectively by Sharpener Pro 3.0. See the crops below for details. A control point showing adjustment sliders One of the biggest new features in Sharpener 3.0 is the addition of nik's unique "U-Point" technology which is also found in their other products including Capture NX. U-Points are a very fast way to select a portion of an image to apply an effect. Each point allows you to set the area it affects as well as the scale of the effect. Personally I've gotten so fast with Photoshop's native Quickmasks on layers and adjustment layers that I haven't made that much use of U-Points. But they offer one big advantage in this case that has me learning them in a hurry. They don't just allow "masking" of the effect, each U-Point can actually modify the effect for it's area. So you can in effect have serveral different sharpening settings working all in the same layer. How cool is that! When Adobe first added Smart Objects they were of very limited use to photographers. A little at a time they have been extended and plug-in support for them has expanded. With the release of nik Sharpener Pro 3.0 running on Adobe Photoshop CS3 just about all the pieces for a complete Smart Filter workflow are in place--at least in our studio. With Dfine 2.1 or Noise Ninja 2.2 for noise reduction (I really like Noise Ninja but it's quite convenient to use Dfine since it is integrated with the rest of the nik tools), ColorEfx Pro 3.0 and Curvemeister 3.0 for my color correction and other special effects, and finally nik Sharpener Pro 3.0 for Sharpening I can do all of my work with reversible Smart Filters. That way I can go back and tweak any setting without starting over or even re-doing an entire layer the way I used to. I'm certainly not completely converted to working with Smart Filters as the frequent re-rendering can be slow and I'm very familiar with a layer based workflow, but I'm pretty convinced Smart Objects and Smart Filters (or whatever they will be called in the future) are the way forward because of their large strengths in non-destructive editing and even in smaller image sizes. Of course increasingly speedy computers are an important part of the solution. 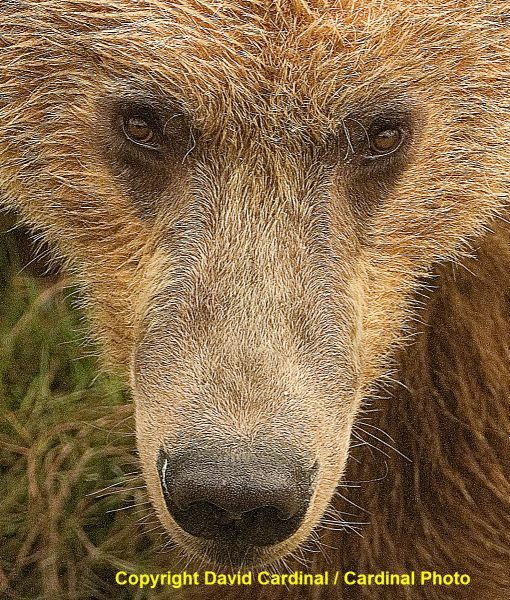 This crop is of the bear sharpened with Sharpener Pro 20 using a Mask. Notice the loss of color detail around the eyes. This version is for an Epson Inkjet so of course it looks odd on screen, but is used to illustrate a sharpening comparison. This version is from a Sharpener Pro 3.0 filter applied automatically. Not only does it remove the need for masking in some cases but notice the preservation of color detail & contrast around the eyes. Is nik Sharpener 3.0 the Perfect Sharpening Tool? Well no, of course not. I'm still not completely sold on the Control Point mechanism. In particular for sharpening where rendering to see the effect of various sharpening settings it can be a slow process to evaluate control points unless you are on a speedy machine. And I'd like to see a real separation between "creative" sharpening and output sharpening--so that I can perform the creative sharpening on the image while I'm processing it and then apply output device specific sharpening if and when it gets printed and based on the device I'm printing to at the time. I also found the interaction between the overall sharpening and the sharpening affected by control points to be a little difficult to judge. September 29: Orphan Works bill sneaks through the Senate--on track for passage in the House. This bill severely limits the rights of small copyright holders. Read what ASMP, SAA, NPPA and APA say and how they want you to help stop its passage! September 29: Photokina is over and DP Review has posted Previews of the Canon 50D, the Nikon D90 and the Sony Alpha A900 for those deciding what they want next for a D-SLR. Pretec has also unveiled 100GB CompactFlash cards which will be shipping later this month. September 25: Nikon releases Updates to Capture NX2, Control Pro & Transfer. nik updates Dfine 2.1 to include Smart Filter & Aperture support. September 24:nik Sharpener Pro 3.0, Can Sharpening get any better? Plus a new Photoshop CS4 Learning Center from NAPP. All in issue 6-09 of DigitalPro Shooter the nikondigital.org newsletter. September 23: Details are emerging on Adobe Creative Suite CS4. PC Mag goes over all the different Suite options to help you choose. They've also got a preview of Adobe Photoshop CS4. September 22: Nikon introduces new 50mm f/1.4 AF-S (G) lens to celebrate 75 years of Nikon Optics. With one of these and a D3 who needs light:-) The lens is priced at $439 and will be available in December. September 18: Photodex releases ProShow Producer 3.5--adds Blu-Ray support, integrated audio ripping and more extensive keyframe support into their industry leading slideshow and DVD production package. Available immediately for $249, upgrades start at $89. September 17: Canon introduces 5D Mark II -- 21MP update to the 5D which also captures full 1080p HD video for $3499. 3.5fps stills. September 15: Adobe Photoshop CS4 and Bibblelabs Bibble 5 to be introduced next week at Photokina. After Johnny L's sneak preview at Photoshop World there is a lot of anticipation about CS4. And today Bibble let us know they'll be announcing the world's fastest Raw processor, Bibble 5, next week at Photokina also. So lots of great new tools for photographers coming up this fall. We'll keep you informed as they ship. September 15: Delkin introduced new pop-up LCD protectors for the Nikon D3, D300, D60 and Canon Rebel XSi. September 9: Sony a900 D-SLR aims right at the Canon EOS 1Ds Mark III and Nikon D700. A 24.6MP full frame camera with built-in image stabilization, the a900 is priced at $2999 and is capable of 5 fps at full resolution. The a900 will also have an anti-dust system but still weigh in at a remarkably light 30 ounces. The Sony a900 will use either memory sticks (why don't they give up on the memory stick?) or CompactFlash cards. They have also introduced 16-35mm and 70-400mm Zeiss zoom lenses. The camera is due in November, the lenses in January. Read the Sony a900 product release. Photoshop CS4: The next big thing in Image Processing? Without question Adobe Creative Suite CS4 is the largest single imaging software launch of the year for photographers. Of course for most of us Photoshop is the crown jewel and most exciting product. CS4 is not destined to be a huge leap in Photoshop functionality, but in a very important move it does give Photoshop users the power of Lightroom 2 for editing. That's a huge boost for those of us who use an independent image management and cataloging system like iView or DigitalPro but still want the power of non-destructive editing. Today NAPP also launched an extensive Learning Center where you can determine if CS4 has features you need, the best version to get, and of course the usual extensive array of information on how best to make use of it. CS4 pricing, including upgrades, is similar to previous versions, with Standard available for $699 with upgrades for $199 and Extended for $999. However one possibly concerning item is a listed upgrade price for Extended of $699. Hopefully that is not the upgrade price just to go from CS3 extended to CS4! Resellers say they will have Photoshop CS4 in stock on November 7th, so we've all got plenty of time to get ready! Regular readers will have learned about how we use ProShow Producer to create our online and DVD slideshows. Of course as you might imagine the time we can spend on them is limited and we're really only novices when it comes to using all its advanced features. But you're in luck. Photodex has created a really slick online slideshow based on one of mine as a way to help showcase my work as one of their Featured Photographers. The use of transitions in the show is really mind-boggling and well worth checking out. Check out my show and other features shows that demonstrate what you can do with ProShow. And if you're interested in learning how to do all those cool things yourself, Photodex publishes a great book, A Guide to ProShow, which shows you how to use the extensive features of both ProShow Gold and ProShow Producer.